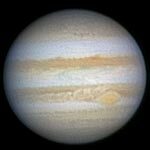 Tonight Jupiter is closest to the earth and rises as the sun sets — the planet is in opposition. This will place it in the sky all night long. As the nights warm up into the spring, you’ll enjoy great views of this gas giant planet. Some of the best planetary images are made at opportunities like this. For detailed planetary imaging you can use Powermate™ amplifiers to boost your scope’s effective focal length. Fitted with the appropriate Powermate™ T-Ring adapter you can connect your DSLR camera to the setup and image the planet. Another way that is to attach our FoneMate™ smartphone adapter to a high-power Tele Vue eyepiece on your scope. Turn on the camera app and share the view of Jupiter with your friends. This is a great method for public outreach. 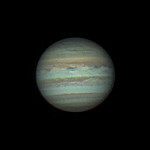 Jupiter posted on flickr with a 2x Powermate through a C14. © John Bartlett. 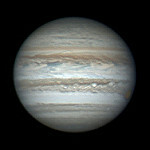 Jupiter posted on flickr with a 2.5x Powermate through an HD11. © Roger Hutchinson. 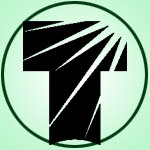 Next Next post: Over the Moon Sale!